If our economy is based on outside factors which are controlled by people of varying motives, we are on shaky ground. But if it is based on our ability, which comes from within, we have a solid foundation. By our very nature, once we learn to look within for all our resources, we are infinite. Whatever we need to live, we have in abundance. Life takes on another dimension. If we base our economy on what we have to give, we are empowered and supplied immensely. By laying the groundwork of our personal economy on a foundation of giving, we can see it expand outward and upward. I love listening to the ideas which come to me from within, taking action on them and seeing them manifest. I love contributing to the economy in this way. 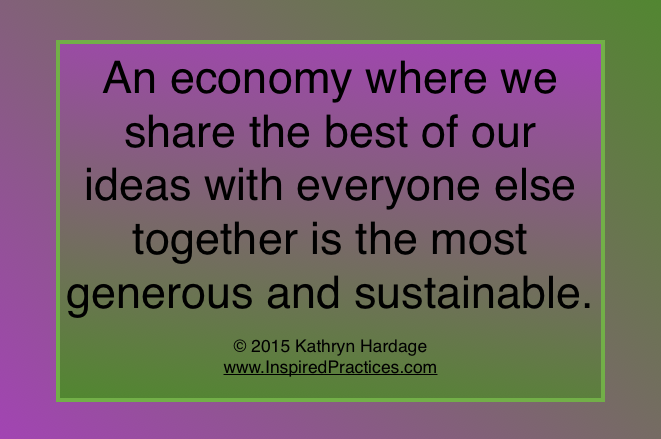 Imagine if our economy were to be built on what we can do for others, what we can give. It is entirely possible to start living in that economy now.